The Couple Special Week of KKK on Colors starts with contestants showing bonding between them and the song Yeh Dosti Hum Nahi Todenge plays to show friendhip. Rohit plans the stunt which is going to test the friendship as the contestants compete against each other as Khiladis and keep their friendship aside. Nandish Sandhu is the wildcard contestant and new entrant joining the rest of contestants. To make his entry fair, Rohit decided that he will be performing two stunts instead of one. Rashami suggests of getting mental support because of her husband Nandish’s presence there and also asks him about veg food. Rohit speaks that all the stunts are perfomed under expert supervision and should not be tried. 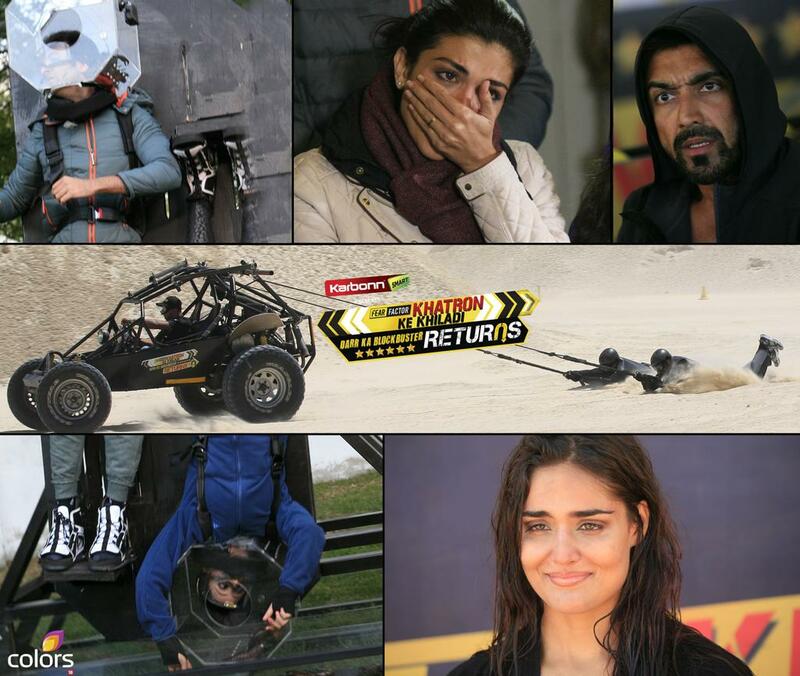 The contestants will be tied to a buggy bike and they will be dragged as the buggy takess circles around a track. There is sand there and the contestants need to make sure on not losing the grip. The buggy will come to a halt when one of the contestants loses grip and loses the contact with rope and buggy. Rohit reminds about the stunt and suggests that stuntman used to do such stunts before as shown in movies and even his dad had performed on it as well. The ordering was decided by sea weeds with contestants needing to fetch out a marker from a box with it. The contestants getting the fear phanda or danger card will get another opportunity tomorrow and if they fail then participate in elimination stunt. The stunt starts and they are dragged on the sand with the buggy bike with some jumps. Both tries hard to not let the rope leave their hands. The buggy takes circular rides and soon the rope gets detached by both of them and loses contact. There is difference of 3 inches between them. Hussain was ahead while Ashish was behind. Ashish gets the fear Phanda and gets another chance tomorrow. The stunt starts and Chang’s hand robe gets detached from the buggy bike while Nandish continues to hold on to his robe. Chang speaks of losing the grip and thus he was detached from the bike. Rohit compliments Nandish on successfully completing the stunt. Chang gets Fear Phanda. Rakesh doesn’t want to accept defeat easily. The stunt starts and Archana loses the grip at the onset after some distance. The buggy comes to halt completing the stunt. Archana speaks of losing the grip after encountering a bump. She gets a fear Phanda. Result: Ashish; Meiyang; and Archana got the fear Phanda. 2nd STUNT: Hum Tum Helmet Mein Band Ho Aur Marren Aa jaye [We are stuck in Helmet and Marrens came to visit us]. Location: RIEBEK School.. The contestants are lying on a platform which is going to rotate and there will be 100 Marrens in the box beneat them. They need to collect the marrens and put them in the box close to their head chamber. The stunt time is 2 minutes and the one collecting the maximum marrens is the winner. Each marren has 1 pt. Nandish speaks of not bringing emotions during the stunt. Nandish starts the stunt and tries to collect the marren while the platform starts rotating. After a while they managed to collect few marrens and the ones falling down are also counted. Soon, they put more marrens in the box and completes their stunt in 2 mins. Rashami got 6 pts and Nandish: 10 pts. Rashami gets the Fear Phanda. Sagarika speaks of worry with creepy crawlies and thinks of going into elimination. Sagarika couldn’t hold the marrens at the onset and Sana also faced difficulty. Soon, Sagarika puts few marrens quickly at once and manages to collect more in short span of time. All the marrens are getting filled in Sagarika’s head chamber while Sana was lagging way behind. Rohit asks Sagarika whether she was looting there. Sana took 14 pts and Sagarika collected 25 pts. Sana gets the Fear Phanda. The contestants needs to open the lever in a glass chamber which is immersed in water and the tube will be placed in such a way giving them few space to come out for breathing during the stunt. They need to swim inside for opening the lever and once it gets opened, the bottom tube chamber opens. They need to swim out completing the stunt. The ordering was decided by the scorpions having markers. There was some fun banter with Hussain and Ashish enacting how Asha and Riddhi act during their warm up sequence bringing laughter. Both stand in the tube which gets immersed in water and they got a few space to come out for breathing. Both starts their stunt and Riddhi needs to come out for breathing at the onset. But soon she gets momentum and opens the lever first and swims out of the tube to complete her stunt. Asha gets the Fear Phanda. Both start their stunt and Natasha gets to the lever quickly and opens it as well to emerge as the winner in very short time span. She didn’t realize quickly on succeeding in her stunt after coming out of water. Iqbal gets the Fear Phanda. Next Episode: There is Water stunt (Iqbal and Archana as a Pair) ; Tank stunt with water and ice and temperature is 3 degree celsius. These stunts are done in pairs and if any one of them commit mistake then both can face elimination. The elimination stunt is inside a glass chamber with poisonous spiders and Iqbal is seen taking part in it.